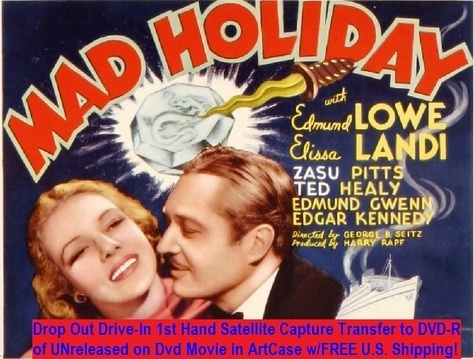 "Mad Holiday" (1936)(Dvd-R) NICELY CAST FUN MYSTERY COMEDY MASTERED FROM MY 1st HAND SATELLITE CAPTURE OF UNRELEASED ON DVD MOVIE ON DVD-R IN ARTCASE w/FREE U.S. SHIPPING INCLUDING DELIVERY CONFIRMATION! And if fan of Elissa Landi check my ads for more titles!